Mathews Ford has always been committed to saving you money. 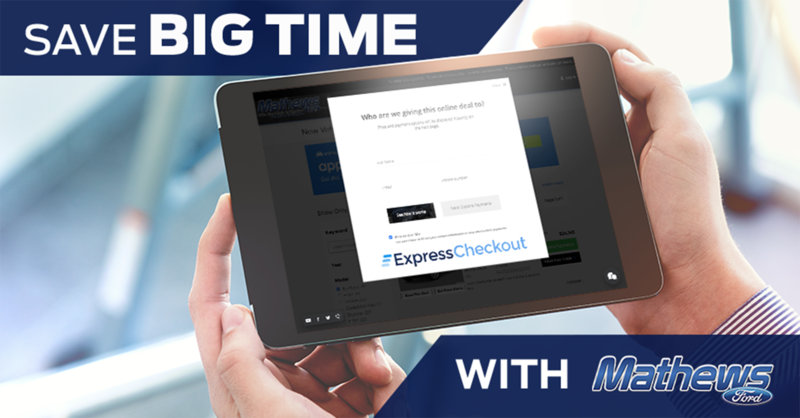 Now, we’re saving you a ton of time with our Express Checkout! We’ve taken all the great aspects of buying at Mathews Ford and combined them with the easiest online buying process around. What used to take hours, can now be done in just minutes! Plus, you can shop confidently knowing you’ll always get our lowest price available. Skip the line and save more time! When you purchase or lease your next vehicle using Express Checkout, you’ll know your monthly payment before you even step through our doors to pick it up. No surprises. No haggling. Just a convenient and completely transparent car-buying experience. ✓ Just choose your perfect vehicle from our large inventory. ✓ No more stacks of forms! Just simply enter your information online. ✓ Find the financing that fits your needs and even get multiple credit offers. ✓ Get a fair and trusted price for your trade. That’s it! Your vehicle will be prepped and ready to pickup at your convenience right at Mathews Ford. With Express Checkout, it’s as easy pick, click and buy! You know Mathews Ford will save you money. Now, get ready to save time! When You Make it Mathews, We Make It Happen!